Foodie Freebie Friday: Vienna Beef Hot Dog Kit! Happy Monday to you and hope you had a great weekend! To start the week off on a tasty note, this week's Foodie Freebie Friday is a special one. It's officially summer (finally!) and why not start it with a giveaway of a summer food... like hot dogs?! 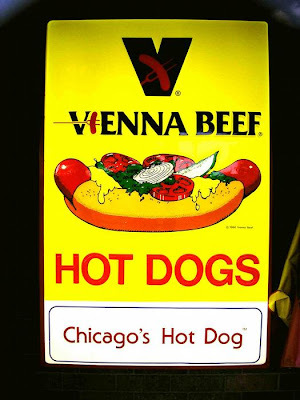 Here in Chicago, Vienna Beef is my preferred brand of hot dogs... and in Chicago, many enjoy preparing it in the traditional Chicago style way. We steam or boil our hot dogs and place them on a poppy seed bun. The fun part is topping it with a good yellow mustard, chopped white onion, a signature "neon green" pickle relish, a dill pickle spear, sliced tomato wedges, pickled sport peppers and a sprinkle of celery salt. However the order we top it, there is one cardinal rule we must follow. No ketchup! In fact, many hot dog spots refuse to even carry it in their establishments! - How do you like your hot dog? Grilled? Boiled? Steamed? Any specific toppings? Deadline: Thursday, June 25, 2009 at 12 midnight CST. ONE WINNER will be randomly chosen by Random.Org's Interger Generator based on the number of your comment and will be announced on Friday, June 26, 2009. Good luck! 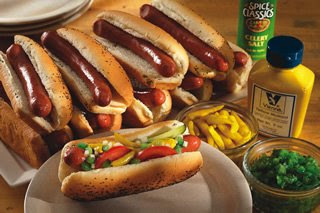 My favorite way to eat hot dogs is with mustard & sauerkraut, coney sauce with cheese and of course Chicago style! I always grew up with boiled hot dogs, but definitely like grilled better now. I love my dogs with chili and cheese. Grilled hot dogs with chili and cheese, or ketchup and mustard & relish. Yum! Grilled to the point that it's *almost* burned, with lots of ketchup (sorry!) and relish. So good! Grilled with ketchup! I'm pretty plain, but I have heard that Chicago dogs are good... would love to win so I can try them! Grilled and almost burnt. I prefer mustard and sweet pickle relish. I love my hot dogs cooked on rollers like you would get at a conveience store. Toppings always consist of spicy brown mustard and chopped onions. I love them grilled with mustard. DEF no ketchup for me!! Favorite...grilled until skin is crispy...add chili..cheese...fresh chopped onion....yum! 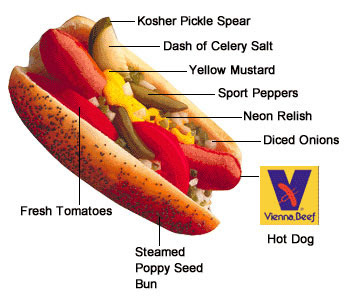 Second favorite is (of course) the traditional Chicago dog! steamed or boiled just like at sports stadiums with mustard, onions, and chili and sometimes cheese...mmmm i love love love love hot dogs they are my FAVORITE food...i could eat them every single day if i let myself! My favorite brand of hotdogs is Kogel Viennas, which come in natural, crunchy casing. I love them grilled until the skin "pops" and then slathered with mustard and onions. Grilled with spicy mustard. Yummy! I loved grilled hot dogs with all the fixin's! I would love to win this I've heard about the Chicago hot dog and would love to expeience it (and the pizza)!!!! I love my hotdogs grilled and burnt...weird I know! I top them with lots of ketchup! I love a good grilled or steamed hot dog with spicy brown mustard and sweet relish. Mmm! boiled with ketchup and mustard, but I love hot dogs at baseball games the most! Definitely grilled. I know it's a sin, but I eat mine with both ketchup and mustard. My absolute favorite way to eat a hot dog is at a baseball game! Grilled, practically burned......with lots of mustard and cheese. I prefer my hot dogs boiled with ketchup, mustard, relish and onion. ... I sometimes put ketchup on it. There, I've said it. Judge me if you will. Whith out a doubt I love my hotdogs loaded.. chicago style. Pepers, Onions, Pickles, Mustard. Really anything salty goes great. I have been known to top my hot dogs with green olives when in a pinch. My theory... If you can eat the hotdog with out a fork you ain't got enough on there! HOT DOG! I love hot dogs! They have always been a favorite of mine. I love my dogs grilled with a meaty chili with beans, and yellow mustard. MMmm. You got my mouth watering! Right now, my favorite way to enjoy hot dogs is grilled, with ketchup,mustard and onions...gottta have the onions! Although after living in Michigan, I grew to love Coney dogs too! Is it wrong for me to admit that I don't like hotdogs? But my family does! My husband grill them and they eat them with mustard, ketchup, relish and onions. My favorite way to enjoy a hot dog is to grill it to the point it just starts to turn black! I think like to top it with Detroit style coney island chili and mustard. Yum! Grilled, slightly blackened, with mustard. Such a great summer meal! What an awesome giveaway to start the summer off! We generally boil our hot dogs, but you can't beat a grilled dog every once in a while either. I typically like mine with onion and ketchup (I know that is a sin in Chicago, lol). I am not picky though and will eat them just about any way. My husband is strictly onion and sour kraut. I am sure he would love those peppers though.